The practical Wenko Double Shower Hook, made of solid stainless steel. 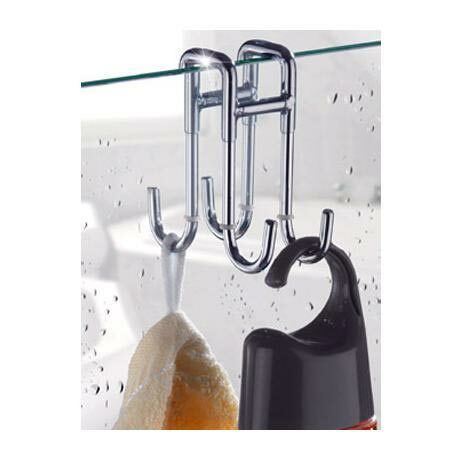 Designed for glass shower enclosures with a max thickness of 2cm, this stylish shower hook has 4 hooks which offer storage for shower utensils, sponges, towels, robes etc. Transparent plastic sleeves protect from hooks from scratches. Perfect for saving space and cleaning up any unwanted clutter both in and out of the shower. This shower hook is ideal for homes with a lot of bathroom products and accessories, but not a lot of space. As it is not fixed to any wall, you can move the hook to any position you wish around the shower enclosure to give you the most efficient showering experience.